A great deal of work went into Thomas Piketty’s Capital in the Twenty-First Century, but to what effect? Anyone expecting an update on Karl Marx’s 19th century Capital will be disappointed. Thomas Piketty’s intent is to place limits on the growth of inequality which his research tells him is the inevitable path that capitalism will take if left unchecked. A laudable aim, no doubt, but his prescription is, as he admits himself, utopian. Actually, it’s worse than that. There’s nothing wrong in a bit of utopian thinking if it takes us into a new realm, a new setting that transcends the present. Piketty, however, is essentially about patching up the system, reining in its worst excesses. Piketty is a long-term supporter of the French Socialist Party and its leader President François Hollande. His overall aim is to provide the policy ammunition to ward off the threat of social and political repercussions, i.e. revolt, against the inequality which arises inevitably from the accumulation of capital. He’s an interventionist on a giant scale, looking towards “a more just and rational social order”, opposed to the privatisation of state assets, worried about climate change and public debt and pouring his emollient sauce hollandaise of progressive taxation over the problem. It’s no wonder that Piketty has stirred so much interest and so much criticism from the defenders of free-market capital. Many of their chief advocates are on the defensive, urging the system to reform itself before it’s too late. Even George Osborne is weighing in against rogue City behaviour. You can smell, see and touch the fear of the mounting revolutionary implications amongst those whose lives are founded upon the past and future of the capitalist system. There’s the project for a long-term “Inclusive Capitalism” led by Lady Lynn de Rothschild of the banking dynasty, whose concern is that ''it is really dangerous when business is viewed as one of society's problems”. Or the warning from Bank of England governor Mark Carney that “unchecked market fundamentalism can devour the social capital essential for the long-term dynamism of capitalism itself”. Their concerns rise when election results produce support for what they perceive to be anti-business parties: “It’s not good for business when the people don’t trust the future,” says Rothschild. They don’t have to fear Piketty. 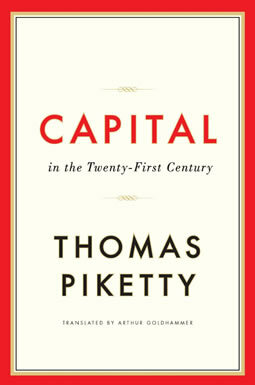 Unlike Karl Marx’s magisterial contribution in Capital, in which he laid bare the laws of capitalist accumulation, Piketty’s analysis, though challenging the dominant neo-liberal prescriptions, is designed to extend the life of the current system of the exploitation of labour for profit. Since 2011, a wave of revolt in country after country has seen the millions of the 99% pouring onto the streets demanding and in many cases securing the overthrow of the incumbent government, combined with an assault on the state itself. Following the crash of 2007-8 that ended the credit and debt induced boom set free by the deregulation of the 1970s, conditions for the majority deteriorated steeply. At the same time, the accumulation of wealth by the 1% accelerated, concentrating an increasingly greater proportion – as Piketty’s statistics show – in the hands of the 0.1% or even the tiniest minority of the 0.01%. But little of this – beyond the gunning down of 34 striking miners at Marikana in 2012 with which he opens and closes – appears in the almost 600 pages of Piketty’s book. So what IS in the book? The analysis is largely concerned with the evolution of individuals’ income from labour and from capital in the small number of countries – pre-eminently France since the 1789 revolution – for which usable longitudinal data from a variety of sources is available. In defining his system of concepts, Piketty focuses attention on a specific set of relations chosen to model the changing balance between these two sources of income. He highlights the relative decline of “rentier” income, and the recent rise of the exorbitantly remunerated “super manager”. In the history of inequality, the rise, fall and return of the role of inheritance looms large, but its relative weight changes as the rates of growth – demographic and economic – rise and fall, moving the balance from a 19th century small number of almost absurdly wealthy “rentiers” who don’t need to work, to a much larger group, the 20th century post-war middle class of “petit rentiers” whose income combines the benefits of inherited wealth and salaries from the exercise of their labour. Growth, its acceleration and slowing, is taken as a given, its history outlined. But why it should occur at all is not considered. Why it has become the over-riding concern for economists and politicians isn’t up for discussion, at least not in any depth. And, unlike the implications of Marx’s law of the tendency of the rate of profit to fall, Piketty’s laws offer no explanation of crisis. Bubbles, apparently, just arise from “general enthusiasm” fuelled by self-fulfilling beliefs. But does Piketty see any significance in the rise of transnational corporations? Apart from their role in providing the organisational basis for spiralling incomes for top officers, and their ability to register taxable income in the most advantageous country, almost none. The powerful, dominating presence of the global corporations who have grown to control a vast and increasing proportion of the world’s minerals, fossil fuels, agribusiness, manufactured goods, intellectual products, and financial transactions are hardly visible. There’s a reason for this myopia. Piketty wants to sustain and extend the post-war “social state”, of universal education, health care and pensions. This is the type of state that never arrived for the majority of the people of the world and has all but passed into history for those for whom it did. Throughout the book, war and crisis – “the shocks of 1914-1945” – are treated as exogenous, accidental disturbances, interruptions to the “normal” process governed by or rather described by the two ‘fundamental laws’, rather than as the necessary consequences of the contradictory dynamic described by Marx which drives capital accumulation and demands its destruction when markets become saturated. This is an historic account of economic developments beset by accidental, unfortunate events rather than a work of political economy. “Capital” is used by Piketty as an eternal category – metamorphosing from agricultural land to industrial and financial capital (and including slave capital), rather than in Marxist theory as historically limited. He attempts to reduce everything to a dubious sameness to enable a spurious continuity. Piketty’s fundamental “laws of capitalism” are little more than simple formulae, statements of mathematical equivalence telling us nothing about the revolutionary metamorphosis of social relations that produced capital or its internal contradictory logic. The intent is to show that its worst effects can be ameliorated by the actions of rational, well-meaning people. Though the French revolution of 1789 makes its appearance, its greatest contribution, for Piketty, is in the establishment of a regime of universal taxation and a system of recording of wealth and income that made his work possible. Piketty is driven by a sense of morality and injustice derived from the petit-bourgeois world-view contained in the works of Balzac, and Hugo from which he draws not just inspiration but evidence to support his argument. His work is infused by the spirit of Les Miserables. The notion, as Marx demonstrated, that all income streams – that of capital and of the worker – are both the product of the same labour never enters the closed conceptual framework of this bourgeois economist. According to Piketty, value is added by firms, value is measured by market price. In this view of the world it is perfectly natural for income to accrue to capital as its right. That this came about as the result of a historical process which produced a set of legally-bonding social relations now regulated by the state that make labour-power – the ability to work and produce value in the form of a commodity – is beyond consideration. Piketty’s hypothesis is about the determinants of income inequality. He tests for statistical correlations between and among a variety of factors. But the choice of the factors he selects are guided by a theory about the way the economy works. His choice of data sources, and his presentation of them is guided by that theory. The discovery of statistical correlation – a mathematical regularity in the relationship between two sets of data – isn’t sufficient evidence of a direct causal relationship between them. But finding a regularity in the absence of any contradictory evidence tempts the analyst to declare the discovery of a “law”. Piketty’s ‘laws’ are like that. He finds a relationship between the rate of growth and income and declaring it to be a “law” stops the search for a deeper explanation. But as he is forced to concede, a “truly global tax on capital is no doubt a utopian ideal”. It is also based on a fundamental failure to understand the relationship between the modern capitalist state and the capitalist economy. His belief in the power of governments and the state is rooted in a past period of economic and political history. Before contemporary globalisation, it’s true that states had more say when it came to the economy. But it was always relative to the requirements of capital, the stability of the national currency, external factors like trade or even military war and the demise of traditional industries under the impact of international competition. The social state, delivering health, education and security in retirement, to which Piketty is so devoted, has given way to a collection of market states. Their policies and actions are orchestrated by a reducing number of transnational corporations operating with the aid of a handful of unelected global agencies. In practice, they are beyond the tax reach of national or regional governments, as are the financial markets that service production and distribution. In the face of the acknowledged power of the wealth, Piketty sets his sights lower. Instead he argues for a step-change in the democratic process in Europe. In the wake of the European election results, however, his idea for a strengthened political and fiscal unification centring around “a new parliamentary body to reflect the desire for unification that exists within the Eurozone countries” is equally pie in the sky. The larger aspiration – to challenge the inevitability of the inequality resulting from the accumulation of wealth – behind Piketty’s plea for a greater degree of democracy is welcome. The objective logic of the global crisis drives Piketty to the edge of a breakthrough, theoretically testing the limits of accumulation, but the proximity of he and his colleagues’ collective nose to the statistical grindstone leaves them blind to the new reality. Piketty wants democracy “to regain control over the globalised financial capitalism of this century”. In truth, it never had it in the first place. Forms of democracy that transcend the present state and facilitate a transfer of power and wealth to the majority need to go on the agenda. A French revolution for the 21st century.